So its Sunday afternoon the 3rd of September and only 3 days until i start the 24 hours of flying and a 3 hour drive journey to get me from Auckland, New Zealand to Zaton, Croatia, possibly the exact opposite side of the world. i have no idea what to expect once I arrive in Croatia, this is by far the biggest adventure that I think I am embarking on. It has been a whirlwind few months and its now as real as it gets. I managed to get out for one last practice session yesterday afternoon and in typical Auckland fashion there were 4 seasons in one day, 3 rounds in the warm sun and the last in cold rain which made me really look forward to the warmth of the Croatian late summer. 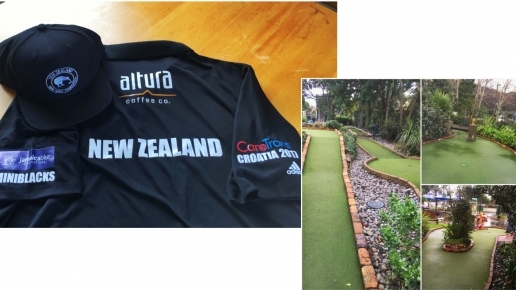 I feel that I�m as prepared as I can be considering we don�t have the types of courses that we will be playing on in Croatia especially for the general class world champs. The WAGM hopefully will be a little more like home. The practice sessions have been spread over just playing rounds on our local courses and getting in rhythm with my stroke and timing, and setting small target gates in my house to try my best to mirror the small openings and gates that that I will come across on the Felt and Eternite. But with all that said actually getting on the courses and spending some serious hours leading up to the championships are going to be very very needed. whatever happens this is going to be a great adventure and something to just take it in and enjoy, meeting new friends from around the world, competing against the best from around the world of mini golf and experiencing a new country. next stop Croatia. I hope to See you there if you are going, if not I�ll do my best to document my experiences while there. Safe travels! Say hello to my fellow USA players - they are a great group of men/women and will treat you well (especially once you say you know me lol).